One British soldier dies by suicide every week, more than are killed fighting the Taliban in Afghanistan according to a BBC investigation. The British government does not record the suicide rate among ex-soldiers, but researchers at the BBC’s Panorama programme have discovered that 21 serving soldiers killed themselves last year, along with 29 veterans. This total of 50 male suicides is greater than the number of British soldiers who died in Afghanistan where 44 were killed in the same period (40 of whom 40 died in action). Male suicide is one of the key issues addressed at the Third National Conference for Men and Boys so BUY YOUR TICKET TODAY to take part in this event. The pattern is repeated in the US where the government has be tracking suicides since 2001. The figure reached a high of 349 suicides last year compared to 311 war zone deaths. While the Ministry of Defence in the UK hasn’t kept records on suicides, it has begun a statistical PR battle following negative press about the mental wellbeing of service men. In recent years the South Atlantic Medal Association, which represents and helps Falklands veterans – has claimed that more veterans (264) have killed themselves than died on active service (255). In March 2013 the King’s Centre for Military Health Research revealed that servicemen are at great risk of committing a violent crime, with those under 30 being three times more like to have a conviction for violent offending than the general population. The MoD has hit back with research claiming suicides amongst Falklands veterans was lower than claimed and responded to the Panorama investigation by saying that rates of suicide within the serving military were lower than comparative rates in the civilian population. In referencing only “serving military” the MoD fails to address what happens to men once they leave the military. 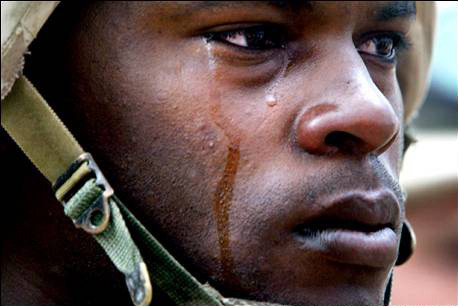 According to the Royal College of Psychiatrists, you men leaving the military are at 2-3 times greater risk of suicide. The former head of the British army, General Sir Richard Dannatt, also says he wants the suicide rate among veterans to be monitored. “It’s pretty clear to me that it should be happening because once you have some statistics you can start to do something about it,” he told the BBC. You can watch a Panorama special, Broken by Battle, on BBC One at 21:00 BST or Monday, 15 July or catch up later on the iPlayer. This entry was posted in Men's Mental Health, Suicide and tagged Afghanistan, BBC, British Army, Falklands War, King's Centre for Military Health Research, male suicide, Ministry of Defence, Panorama, Royal College of Psychiatrists, Southa Atlantic Medal Association, Taliban, US military. Bookmark the permalink. Yes, I remember reading a stat that there were more American soldiers committing suicide than were dying in combat in Iraq.